The lineup for the Jordan Flight Luxe expands with this “Gym Red” colorway. This release would’ve been prefect for the month of October, but Jordan Brand decided to make them available ahead of the upcoming season. Dressed in a Gym Red and Black color scheme. The Air Jordan 15-inspired Jordan Flight Luxe comes constructed in a slip-on style that moves like a low-top but delivers the stable feel of a mid-top, providing supreme comfort for every part of your day. 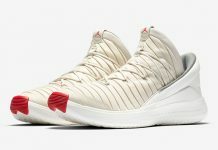 You can now find the Jordan Flight Luxe “Gym Red” available at select Jordan Brand retailers like Rock City Kicks and Nike.com. The retail price tag is set at $120 USD.